Almost 80 percent of those killed as a result of the Israeli bombing of Gaza are civilians, the United Nations said in a report. 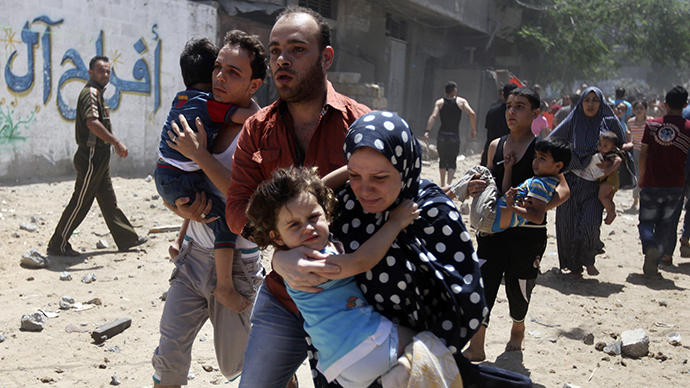 The death toll from the week-long Israeli airstrikes on the Gaza Strip is climbing to 200. More casualties are feared as the attacks resumed Tuesday, six hours after Israel unilaterally entered an Egyptian-proposed ceasefire that was rejected by Hamas’ armed wing who continued cross-border rocket fire. 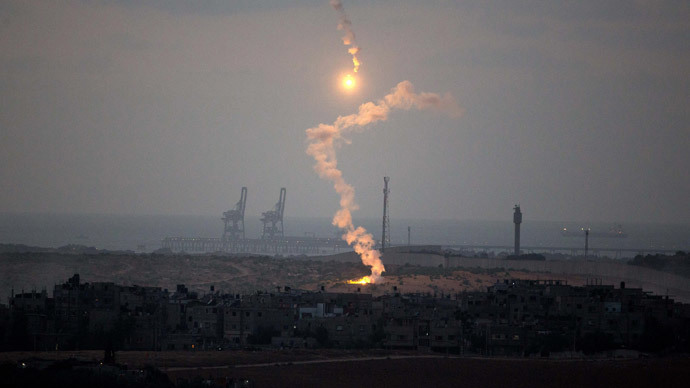 The Israeli military said that during the supposed truce about 50 rockets were fired by Palestinians all over Israel; no injuries were reported. 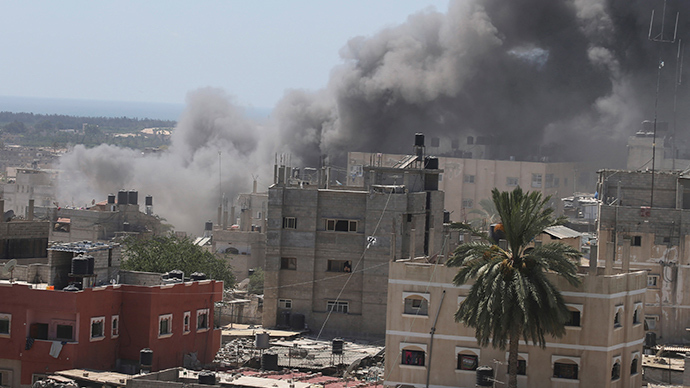 According to a report by UN Office for the Co-ordination of Humanitarian Affairs (OCHA), over 77 percent of fatalities since the beginning of the Israeli Operation Protective Edge on July 7 have been civilians. By Monday, when the UN report was issued, 138 civilians, including 36 children were killed in the attacks. 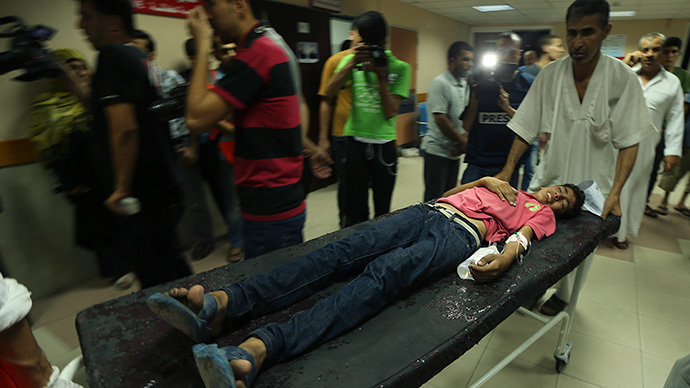 Over 1360 Palestinians were injured, “of whom 386 are children and 249 women,” OCHA said. Some 1,255 homes were destroyed or severely damaged in Gaza, tens of thousands of Palestinians have fled their homes following Israeli warnings, and 17,000 have taken shelter at UNRWA (UN aid agency for Palestinians) schools.The vast majority of the displaced fled their homes with few belongings, including families who lost everything under the rubble of their destroyed homes. “Gaza’s water utility has suspended emergency operations and repairs due to the insecurity of its staff, and warned that water supply to 600,000 is at risk as a result,” the UN says. “The level of human losses and destruction in Gaza is really immense,” the aid agency’s spokesman Sami Mshasha said Tuesday, as cited by AFP. The official said that 560 homes had been totally destroyed, while thousands of buildings – including 47 UNRWA facilities - got damaged by the bombings. He called on the warring sides to respect UN buildings. 47 UNRWA facilities including schools, clinics and warehouses have been damaged by air raids & other fire in violation of international law. Last week, Israeli bombs destroyed a mosque in the central Gaza Strip, which Israeli military said was used as storage for weapons. Several other mosques as well as Hamas-affiliated charities and an Islamic home for the disabled were hit by the strikes. Israel, facing bitter criticism from international rights groups, has insisted that it tried to minimize casualties among civilians and targeted sites affiliated to Hamas, including command centers, issuing early warnings before attacking. It also blamed Hamas for using civilians as human shields by firing rockets from densely populated areas. Palestinians also came under criticism from the international group. “Reports about the launching of rockets by Palestinian armed groups from densely-populated areas have raised increasing concern, as it endangers the lives of Palestinian civilians residing in these areas,” the UN said. According to Israeli Defense Force (IDF), over 1080 rockets have been launched at Israel since the beginning of the operation, with 845 of those hitting the territory of the country. 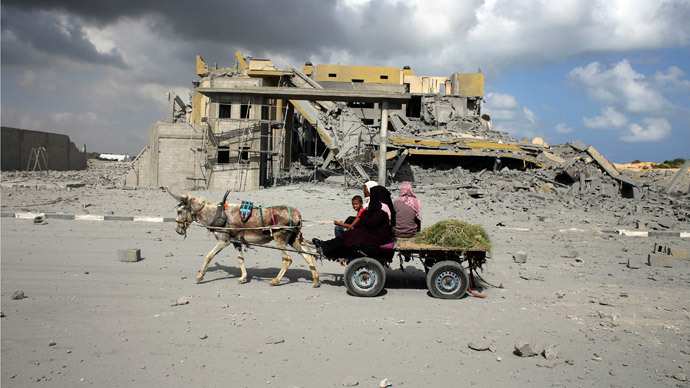 On Tuesday alone, “Hamas in Gaza has fired 76 rockets at Israel,” the IDF said. That is including 47 rockets launched during the hours when Israel has suspended its attacks. In the early hours on Tuesday, three rockets exploded in and near the Israeli Red Sea resort of Eilat. Four people reportedly sustained minor injuries. Two rockets struck inside the city that borders both Egypt and Jordan while s third one landed in an open area, reported Reuters citing a military spokesman. Israel Radio said officials alleged it was fired from Egypt. On Monday, rockets were fired at Israel from southern Lebanon, resulting in retaliatory artillery fire from Israeli forces, Lebanese security officials and the Israeli army said. There was no immediate claim of responsibility. The current offensive is the worst outbreak of violence between the two bitter rivals - Israel and Palestinian militants - since a similar campaign in November 2012 to stop Gaza rocket fire. The fresh fighting was triggered by the kidnappings and killings of three Israeli teenagers in the West Bank, followed by the abduction and murder of a Palestinian teenager in an apparent revenge attack.